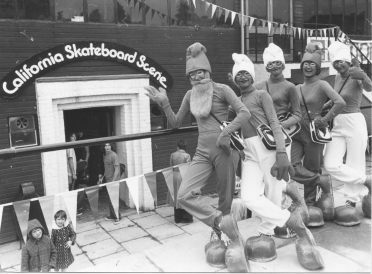 Actually, it's not as bad as it sounds, it was the Smurfs but when the costumes came off it turned out to be Legs and Co. They were joined later that evening by the one and only Emperor Rosko who ran a disco in Didoz. Marshals checked all the skaters to ensure they had the correct safety equipment and that they were skating within their limits. Badges of differing colours were issued to denote varying levels of competency. Skate kids ruly - OK! 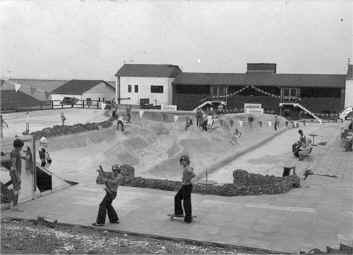 Adults who think skateboarders are an unruly lot should go to the California leisure complex in Dunstable. 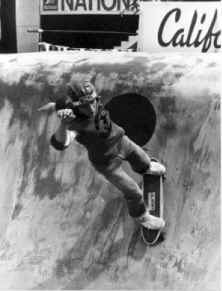 There they will find that self-discipline among the youngsters is remarkable at the California Skateboard Scene, says Mr. Bill Seymour, who opened the arena on Saturday. Hundreds of youngsters have been turning up for two hour sessions and on Saturday they were given exciting demonstrations by professional stars. "We are very pleased with the way it has gone" said Mr. Seymour. "We found that we had enough ramps and equipment for all the kids to have a go and they were zooming around all over the place. I was especially pleased with the way they organised themselves. We have appointed some Marshals, but they were hardly needed. The kids were very self disciplined and when it was their turn o=to come off the equipment they went straight to the back of the queue without any argument. A lot of parents turned up to watch and they were delighted." Already proficiency badges are being issued and in a week or so competition teams may be formed. The shapes of the equipment will be changed frequently because the young skateboarders are becoming expert so quickly. "We are now taking down the stage and putting up a 60ft long ramp." said Mr. Seymour. They were doing daffy ducks on the snake runs and tail-and-nose wheelies in the bowl at Dunstable. 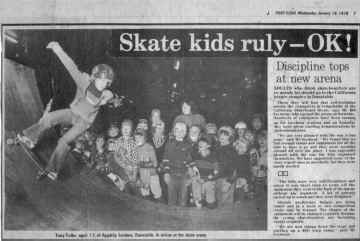 The words are part of the strange vocabulary that has grown up around the sport of skateboarding and were used by competitors in the Eastern Region semi-finals held at the California rink. For the uninitiated, a daffy duck is having one foot on the skateboard and the other tipped up, while nose wheelies are a maneuver with the feet placed at the front of the board. 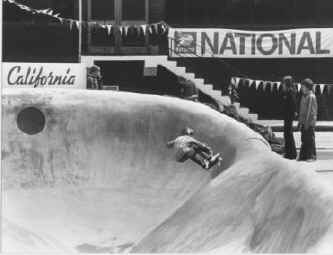 The snake run is the run into the bowl.